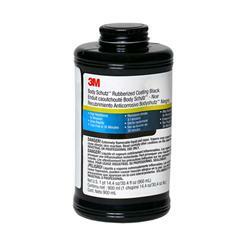 Jaco Aerospace and Industrial is your one stop resource for 3M(TM) Body Schutz(TM) Rubberized Coating Black, 08864, 1 Quart, 6 per case and all of your 3M Products, Tapes, aerospace and industrial needs. SKU Marketplace Product Description: Black, rubberized, protective coating developed primarily for use as a sound deadener, protective coating, and underseal. Bonds to a wide variety of surfaces. Use with applicator gun, part number 08997.